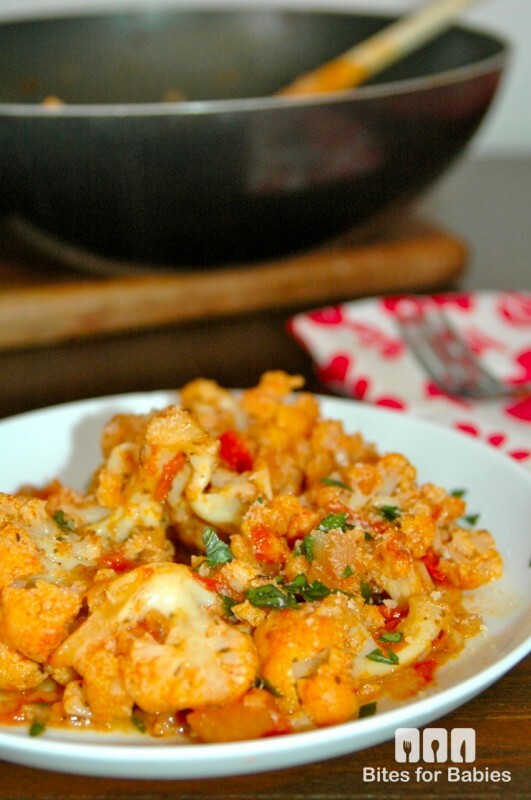 This Mediterranean style cauliflower recipe will have your little ones excited about eating their veggies again. 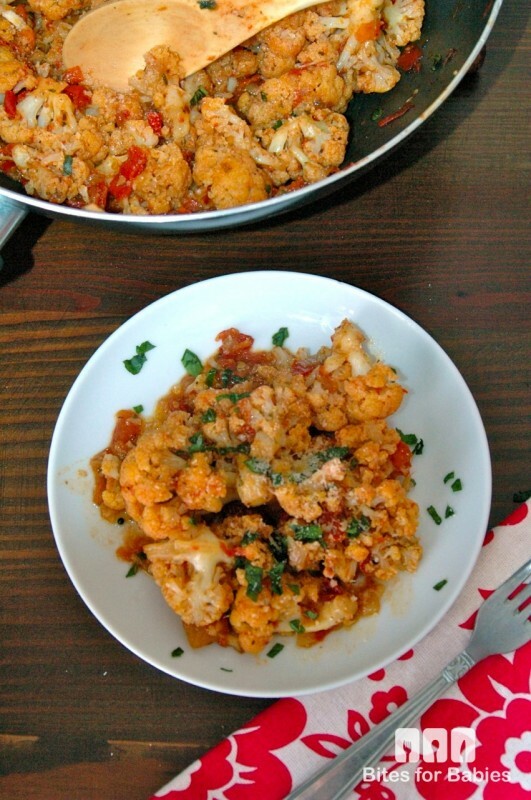 Pan-roasted cauliflower florets tossed in a healthy tomato sauce and seasoned with Mediterranean spices, such as oregano and basil. Neither of my kids is fond of cauliflower. If your kids are anything like mine they probably began shunning vegetables at around 2 years old. I’ve come to the realization that in order to get my kids excited about eating their veggies they need to be either doused in tomato sauce or smothered with melted cheese. 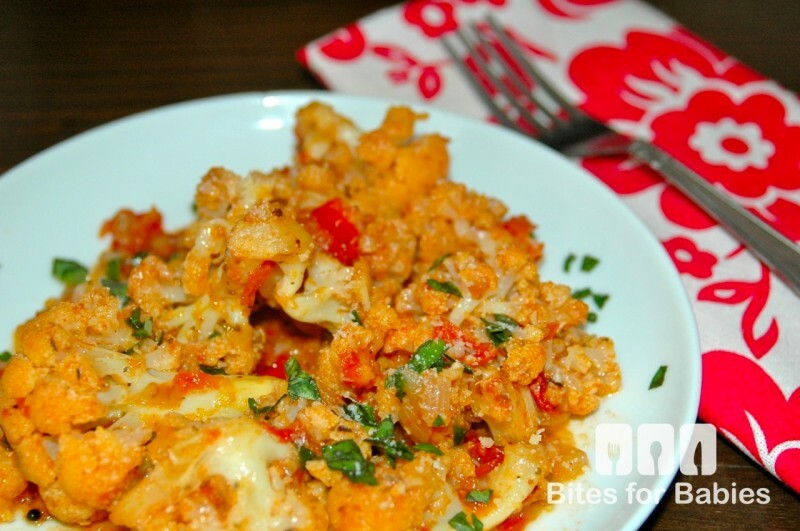 The sauce does the trick quite nicely in this recipe! 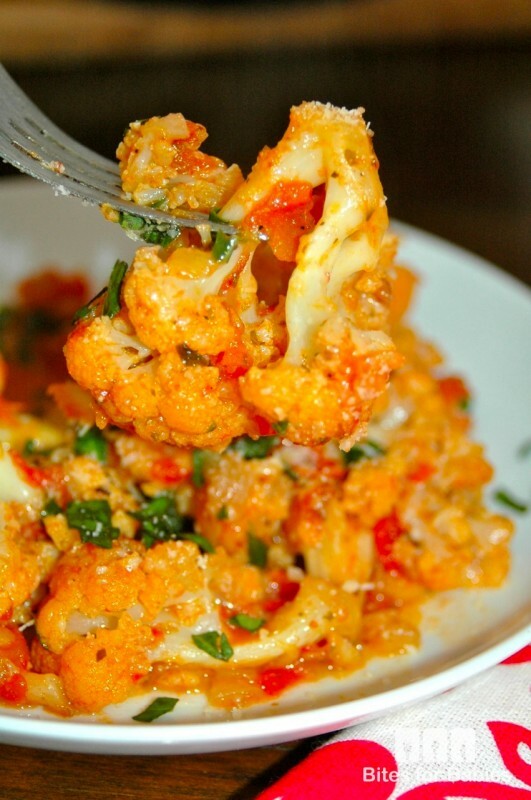 Although the consistency of the cauliflower remains the same, its strong flavour is almost completely masked by the sweet tomato sauce and aromatic spices. 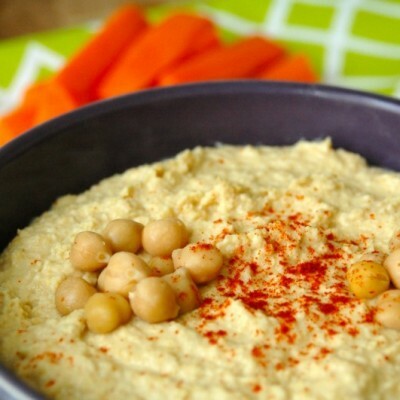 Make this recipe baby-friendly by omitting the salt, pepper and hot pepper flakes, if desired. 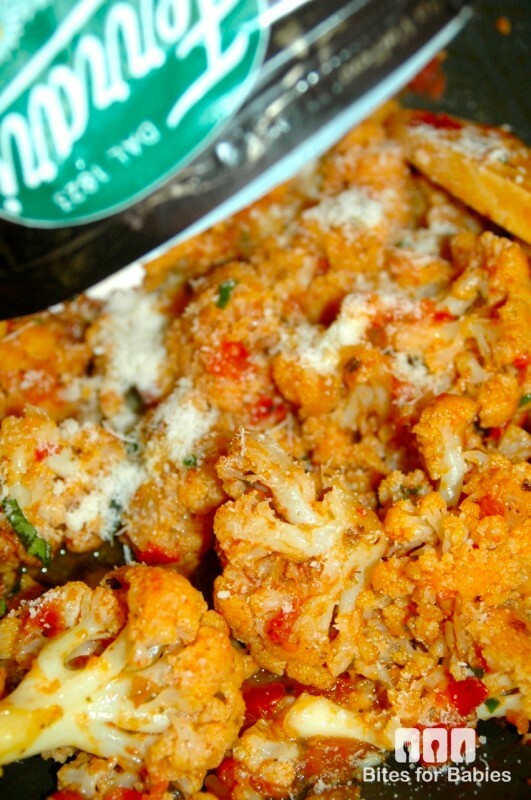 Cook the cauliflower until very soft then mash with a fork or pureé in a food processor until smooth. *You can substitute the fresh tomatoes with diced canned tomatoes however, the quantity of additional water added to the recipe should be reduced by at least 1/2. Heat olive oil in a large frying pan on medium-low heat for 1-2 minutes. Add the garlic and onions and sauté for 5-7 minutes or until translucent. Increase the heat to medium-high. 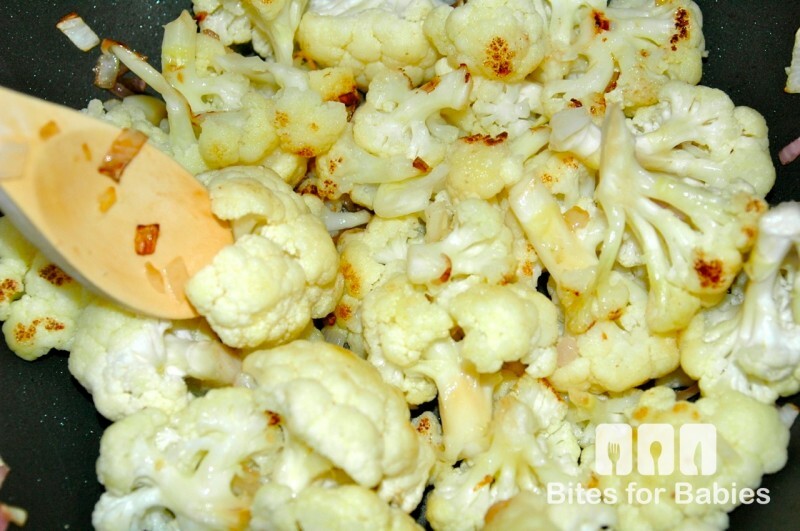 Add the cauliflower florets and sauté for 5-7 minutes (tossing a few times) or until lightly browned. 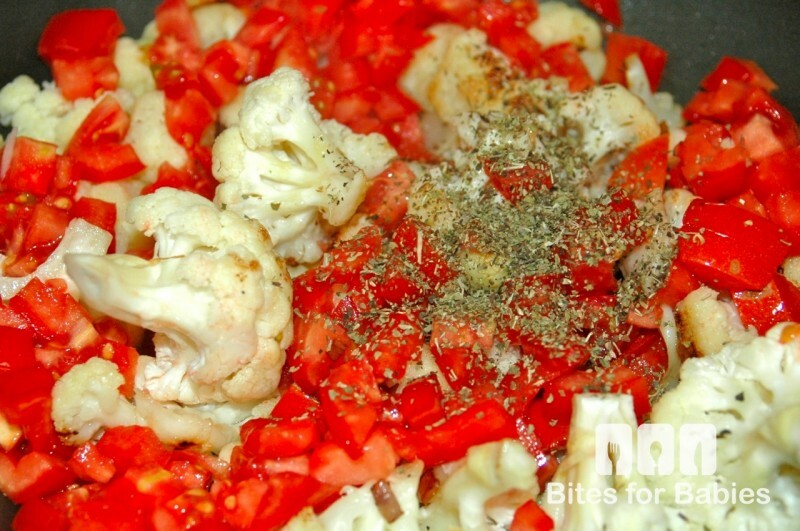 Add the tomatoes, oregano, and 1/2 cup of water and continue to cook (covered) on medium-high heat for 30-35 minutes or until the cauliflower is fork tender. *If the liquid evaporates too quickly add more water (about 1/4 cup at a time) until the cauliflower is cooked and the liquid thickens to a sauce. Season with salt, pepper, Parmesan and hot pepper flakes (if desired) to taste. Serve warm garnished with Parmesan cheese and a sprinkle of freshly chopped basil. Store in the fridge in an air tight container for up to 3 days. Just use the gluten free flour, you just need a little bit. I have also made a pizza crust using cooked cauliflower. You mash it and add a bit of flour to get the right consistency and then bake for a few minutes till a bit brown. Then add your toppings and bake again. Delicious. I’ve been meaning to try cauliflower pizza too! I wonder if almond flour would work for a gluten-free option?? Can you microwave the cauliflower for a few minutes first and they fry so it takes less time? I want to try this recipe. I’m sure you can…try it and let me know how it turns out! I’m excited about this recipe! Awesome idea! this looks incredible!! I’m going to make it for myself!! !